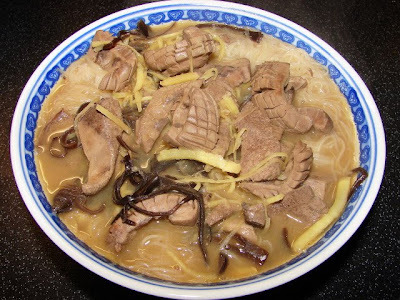 Rice wine and sesame oil vermicelli noodle soup 麻油酒麵線 is a celebration dish, very popular with Fuzhou 福州 and Hokkien (Fujian) 福建 people. Many after-birth mums will eat this, not sure if the doctor will recommend if the mum is breast feeding because it has oodles of rice wine added, for centuries many Chinese mums had eaten this so I don't see how bad it could be. This noodle soup is also common for birthdays and CNY. It is great if anyone has cold feet or get cold easily and for winter too because it has lots of ginger and rice wine. One bowl of this will keep you warm for hours. Not recommended if you have high blood pressure problem. For this wine vermicelli noodle soup I used pig's kidney and liver. Pig's kidney and liver are treasured by Chinese they are usually more expensive than any pork meat in the far east. In the western world many people don't like them so they are really cheap. I bought a pair of decent size kidneys and about 1 lb of liver for less than £1.20, cheap as chips. If you hate offals you can also cook this noodle soup with just chicken, very tasty too. The noodles used is not the common type it's very fine wheat vermicelli which is salty. It's called mien sien 麵線 or mee sua in Hokkien. 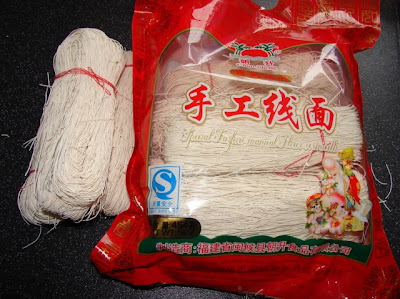 Here is a video how these noodles are made. It's amazing how the dough can be stretched to make these silky fine noodles. If you are to buy any try to choose one which is handmade. Here is a picture of the one I used. It's very fragile and will break easily. For the wine it is best to use homemade rice wine, if you don't have any can use Shaoshing or other plain Chinese rice wine. Homemade rice wine is usually sweeter and less alcoholic, so you can add more. I made rice wine with just cooked glutinous rice and rice wine yeast ball. Have not seen any red yeast rice 紅麴米 around would love to get some. Red yeast rice makes better wine quite deep red like red fruit juice. Here is the noodle soup recipe. Will feed 4 - 5 people. Slice the kidney into half to reveal the veins, carefully trim off all the veins. Rinse then mix with salt, cornflour and vinegar and leave it for about 1 hour. This will draw out the strong kidney smell/flavour. If you don't mind it strong you can skip this step. After 1 hour, rinse the kidney. Score the kidney on the skin side (outside layer), in criss cross pattern (this will give a nice shape after cooking), then cut into thick slices. Rinse the kidney again and soak in fresh water for about 10 - 15 minutes to remove the salt and vinegar. By now the kidney should be quite clean without the strong flavour most people don't like. Drain and marinate with shaoshing wine and ginger juice for a little while then drain off the marinate before cooking. about 50 - 100g of ginger (if you like mild use less ginger, I normally use 100g or more. It's up to you how much you like ginger), shred the ginger very fine. enough water or chicken stock to top up the soup, about 3 - 4 cups, more wine less water/stock. Stir fry shredded ginger and woodear with sesame oil for about 2 minutes at medium heat till very fragrant. Add in the liver and kidney and stir fry for about 2 - 3 minutes. Add wine (shaoshing or homemade wine) and enough stock/water. Heat high and bring this to the boil then heat off. There is no need to add salt or soy to season the soup the vermicelli is quite salty. Boil a large pot of water, when the water is bubbling rapidly, put in the noodles, handful at a time, this will cook very quickly. Soon as it softened take it out with a spider skimmer or slotted spoon and divide into portions put into soup bowls. Add hot soup straight away and serve. If you think it is not salty enough then add salt or light soy after you have tasted it. I know what you meant about rice wine with red yeast rice. In Indonesia, we call it Ang Ciu. It was more fragrant than the supermarket Shiao Xing wine. About alcohol and new mothers, I remembered someone gave my mom a chicken dish braised in wine and sesame seed oil when my brother was born. I had no idea what the benefits were. Think Chinese believe homemade rice wine and sesame oil are very nutritious and ginger can warm the body. Woodear is added because it can help bruises and blood clotting. A good combination to keep new mums warm and keep away from 'wind'. Wind is a term used by Chinese to describe a symptom which will gives you aches and pains. It's interesting what you sya about new mothers and alcohol. One of my Mum's friend's wants my mum to make some 'Yellow Wine' (黃酒) in the summer. I have no idea what it is or what benefits/health properties it has. I just hope I'm not expected to consume any! I'm already NOT looking forward to the ginger braised in sweet black vinegar! (薑醋 or 豬腳薑) I know my mum will make me eat that! I don't like ginger! I love trotter with ginger vinegar 豬腳薑. Was thinking the other day I should make some since it is still cold. I use hock not trotter. I had a bowl of this ginger wine noodles my face was red hot for quite a while. I love ginger can't get enough. I can see your mum will nag you to eat ginger it's the tradition. Good luck if you don't like ginger. My mum boiled lemongrass and use the liquid for my SIL to bath in. All these are to repel 'wind' and 'coldness' in Chinese is 姜去風,去濕, 去寒, in another will prevent any future aches and pains. I do know ginger is an effective warming food. Vinegar helps sweating 醋排汗 so you will not get 'wind', is this right? I am not sure. This is really a great dish. Brings back a lot of good Foochow memories...thanks. And I have really enjoyed reading your blog . Blog reading has become a good hobby since I retired. God bless. Are you from Miri? If you are you are my nearest S E Asian neighbour. I was born and breed in KB. I still have family in Brunei. One of my SIL is from Miri (Chinese Christian may be you know the family too). I come to UK to study and have rooted here since. Do go to Miri when I am back in KB. Read your blog, interesting and brings back a lot of memories too.